So this was my grand return to the half marathon stage. 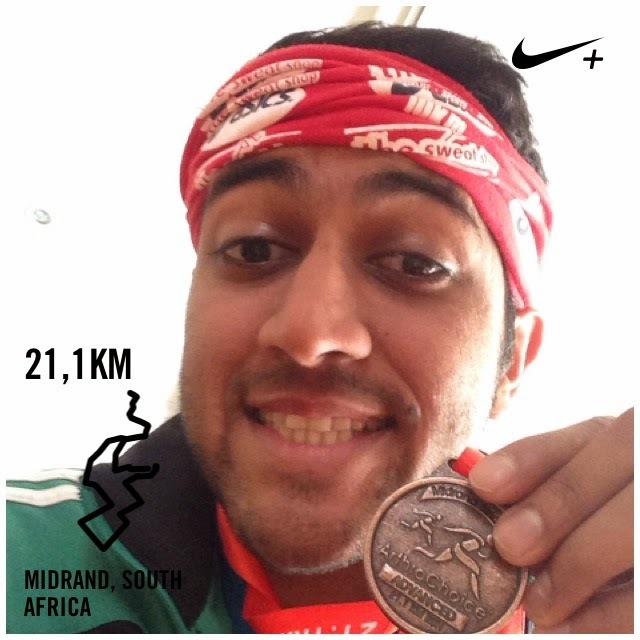 I had run the two oceans half in April, and I did a 21km training run mid-June, other than that, it had just been a few 5k’s and 10k’s along the way. I was a bit worried but I decided to just go easy. It was a lapped route, which had me concerned because I can’t stand repetition when I’m running. It went surprisingly well, although I did feel quite tired towards the end. The medal was great though! The organisation was good, no hiccups. Half marathon number 2 for August! I treated Old Eds as my warm up so this was supposed to me getting back on the pace. Organisationally, this was a disaster. My friend and I left early in search of the finish line, where we caught the bus which took us to the start. They didn’t have a gun at the start so after waiting half an hour too long, the organiser started the race with, “Ok you can go now.” Because I had waited for so long, I was eager to go so I bolted off from the start and after 9kms or so, I realised that I had gone too fast, too soon. My problem was that I was unable to slow down because I had ‘locked in’ the pace. I knew I was doomed, but I carried on. I took a few walk breaks here and there but at km 16, I was ready to give up and just walk the last 5kms. Just then, some people I had previously overtaken a few times, caught up to me and encouraged me not to give up. I ended up running with them for the next 5km’s, and even though I was exhausted, and I had nothing left in me, I just carried on because of the way they were motivating me. I couldn’t have finished the race so strongly (2 hours) without their help! Running through the Soweto community was truly amazing. Ok so this is where I was probably biting off more than I could chew. I expected the Wits race to be easy, and relatively flat. Sadly, I was wrong; it was a lapped route, riddled with crazy hills. Right from the start, we ran up one of the most intense hills I’ve ever had to face, and when I remembered that it was a lapped route and that I would have to run it again, I wanted to cry. I had to walk every now and then in this race but I ended up finishing at a time which was slightly quicker than my Old Eds time. This race had a bit of a crazy start, due to the high number of people pushing through the narrow Wits exit. I liked the fact that toward the end of the race (km 17) they were giving out bananas and oranges for those who needed the extra calories to get to the finish line. I didn’t take anything because I never eat during races, and I wasn’t about to start. I discovered this race because ChampionChip emailed me about it, so I figured I’d tackle my fourth half marathon of August. My plan was to use these races to build a base for myself to get into the longer distances. I arrived at the Equestrian estate quite early, it was cold, my phone told me it was -1 degrees, and my mind told me I was crazy. The race started off with quite a few downhills, for which I was grateful, until their uphill counterparts came haunt me. I tried running behind some faster Nedbank guys but then the old saying ‘run your own race’ came to mind so I slowed to my own comfortable pace and pushed through the tremendous hills of Midrand, finishing in a time of 2 hours and 12 minutes. This race was really well organised and with only 500-600 people, it was hardly an overcrowded race. They had water points exactly where you needed them, with people constantly cheering you on. I considered running the Wanderers half this past weekend but I decided to rest for the Gauteng marathon which is happening on Sunday. I was told that I was going to get injured many times whenever I mentioned running four half marathons in a row, but being young and stubborn, I soldiered on.